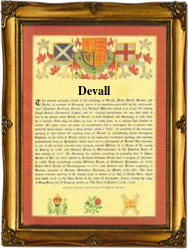 This name, with variant spellings De(a)vall, De Vile, Devill, Deville, Divall, Divell and Evill, is of Norman locational origin from Deville in Seine - Inferieure, probably so called from the Latin "dei villa" i.e., "settlement under the protection of God". The surname is first recorded in England in the latter half of the 12th Century, (see below). One, Walter de (of) Daeuille appears in the 1190 "Pipe Rolls of Rutland" and a Robert de Daiville in the 1195 "Pipe Rolls of Yorkshire". (Note "u" for "v" in the two former recordings). The name appears as Davilla, Deyvill and de Eyvill in Yorkshire in 1200, 1251 and 1260 respectively. On October 26th 1841 Fanny Marie, a daughter, was born to James Deaville and Elizabeth Shadbult in Hoxton Old Town, London. The first recorded spelling of the family name is shown to be that of Walter Daiville, which was dated 1184, in the "Knight's Temple Records of Lincolnshire", during the reign of King Henry 11, known as "The Builder of Churches", 1154 - 1189. Surnames became necessary when governments introduced personal taxation. In England this was known as Poll Tax. Throughout the centuries, surnames in every country have continued to "develop" often leading to astonishing variants of the original spelling.